Convenience foods and restaurant fare are quick and easy but not always economical. If you have some cheap and easy finger foods on hand, you can keep your household budget under control. Want to impress your guests without spending too much of your time or money? Try these fancy-looking (but cheap and easy) finger food recipes. Making your own food is often a great way to save money. 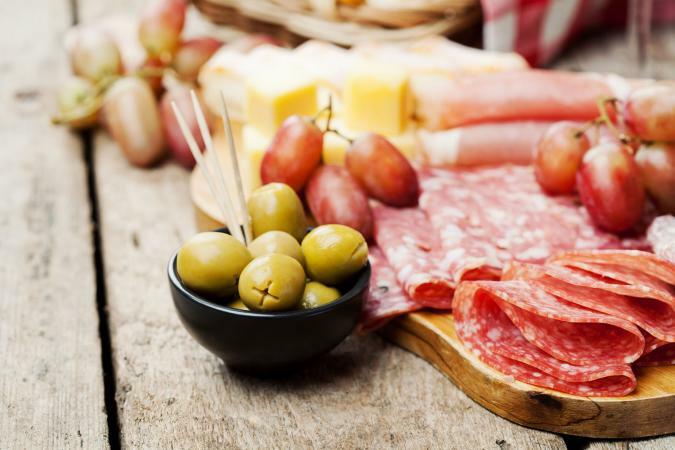 Antipasto plate: Lay out your favorite deli meats, cubed cheeses and olives on a platter or put them on toothpicks for a mini-kebab look. Prosciutto e Melone: This fancy-sounding Italian classic is just cured ham wrapped around melon slices or cubes. Skewer each slice on a toothpick and you're good to go. Mini sandwiches: Prepare an assortment of sandwiches, then use cookie cutters to cut them out into fancy shapes. Fondue: You can buy packets of ready-to-go fondue in your supermarket's deli section. You'll need a fondue pot, but they're usually quite inexpensive. If you buy two fondue pots, you can use one for cheese and the other for melted chocolate; dip bread cubes in the cheese fondue and fruit in the chocolate fondue. Crab cakes: Serve with tartar sauce or an assortment of sauces on the side. Shrimp cocktail: Buy shrimp when it's marked down and toss it into the freezer in order to make this appetizer affordable. Typically, smaller shrimp are cheaper per pound. You could even buy precooked baby shrimp and put them on toothpicks for easy dipping. Chicken fingers are the fancy version of chicken nuggets. 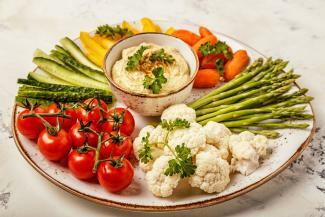 Serve with an assortment of easy dip recipes. Pita bread and Baba ganoush (an eggplant-based spread) and/or homemade hummus. Chocolate croissants: Buy prepared crescent dough and roll each crescent around a handful of chocolate chips, then bake according to package directions. For an even fancier look, grate chocolate and sprinkle it on the croissants immediately after you take them out of the oven. Pigs in blankets: The savory version of the above recipe; simply wrap crescent dough around hot dogs and bake. Optionally, you can wrap American cheese around the hot dogs before adding the crescent dough. For a more formal look, use cocktail weiners instead of hot dogs and cut the crescent dough into strips just big enough to match the weiners. Deviled eggs: If you've already got hard-boiled eggs sitting in the fridge, you can whip these up in no time. Kale chips and dip: Delicious and nutritious, kale chips are easy to make in the oven. They're even easier to prepare if you have a dehydrator. Mini meat pies: You can save time by using a pre-made crust from the supermarket. Shepherd's pie (ground beef and mashed potatoes) is both cheap and easy to make. These snacks take just a few minutes to prepare, and make a nice informal appetizer or just a snack to take the edge off your hunger. Chips and salsa: Homemade salsa lets you choose the level of spiciness you want. Hard-boiled eggs: Getting the method and timing right produces perfect eggs. Stuffed celery: Try peanut butter, cream cheese, salsa, or... use your imagination! Cereal snack bars: Stir up six cups of cereal with a bag of melted marshmallows and a little melted butter or margarine, spread in a 9x13 pan and let cool. Slice them into small squares for a quick snack on the run. Use cereals with high fiber content for a healthy boost that keeps you fuller longer. When you're preparing a lunchbox for your kids (or yourself!) you want food that's portable without being messy, and preferably easy to munch on throughout the day to keep vending machine temptations to a minimum. Nonperishable shelf items are perfect for keeping in the car, your purse or the diaper bag for times when you are running errands and need a quick snack. They're also a good choice for an emergency kit. Check dates once a year and rotate so that you use the oldest ones first. Jerky: Making your own saves a ton of money, plus you can produce a healthier product. Buy generic, especially when it is on sale. Clip brand name coupons and use in combination with a sale. Look for mail-in rebates and use with sales and coupons. Stock up when the price hits rock bottom. Comparison shop even generic brands for the best price at the stores you regularly visit. Ask a store to do a price match for an item if you have an advertisement with a lower price. Many grocery and discount stores will honor a competitor's price if you bring in the ad, which saves you time and gas money. Once you get home, portion out any bulk items, like cereals and crackers, so you only get one serving at a time instead of two or three. Buying prepared foods usually saves you time but costs more money, while making your own foods takes more time but is comparatively cheap. You'll have to decide for yourself which is the better approach depending on what you can better spare at the moment - time or money. With a bit of planning, you can actually minimize how much you spend of both resources!